Zuhairi (left) hands over the cheque to Law while Sarawak Sports Corporation chief executive officer Dr Ong Kong Swee looks on. KUCHING: Former national athletes who have taken part in SEA Games, Asia Games, Commonwealth Games and the Olympics are urged to register themselves as members of the National Athlete Welfare Foundation (Yakeb) so that their welfare can be taken care of by the association. Yakeb general manager Zuhairi Abdul Manaf said yesterday that the registration is free while membership is for life. 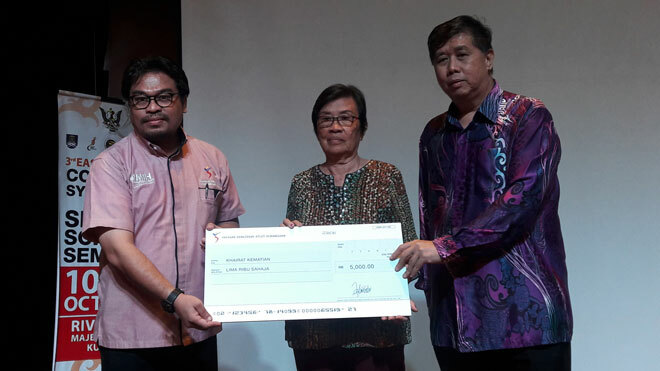 “There are more than 3,000 Yakeb members nationwide and less than 100 in Sarawak,” he told The Borneo Post after presenting a cheque to Lilian Law, the widow of former SEA Games weightlifting gold medallist William Yeo at a local hotel. Zuhairi was in town to personally hand over the RM5,000 cheque to the late William Yeo’s wife Lilian Law. “Before this, we managed to visit William at the hospital where we also met his wife. Our main intention in coming here today is to personally present the cheque to Mrs Yeo,” he said. “I would like to thank the organisers of the 3rd East Malaysia Coaching Symposium and Sports Science Seminar for giving Yakeb the golden opportunity to introduce ourselves and brief the participants on our work. “This is also part of our membership drive. It is very informative and meaningful to those who haven’t registered yet. By being able to explain the members’ benefits to them, I think our visit is very fruitful,” he added. According to Zuhairi, Yakeb was set up in July 2007 under the Company’s Act 1965 with the objective of providing welfare for the ex-national athletes including paralympic athletes. It depends wholly on donations and contributions from the private and public sector as well as the federal government. Some of the privileges that the members get to enjoy are medical insurance, personal insurance, death benefits, business opportunities and financial assistance. Yakeb will also initiate regular gatherings, medical clinics as well as organise activities like motivation and counselling for current national athletes as well. Those interested can contact Yakeb representative and member Ramliee Ahmad at 014-9919249 or Zuhairi at 019-2778449. They can also log on to Yakeb website at www.yakeb.org.my to download the forms. Other Yakeb members in Sarawak include Watson Nyambek (athletics) and Hii King Hung (taekwondo).